This booklet on prayer is an effort to apply the scientific method to the Truths of our Roman Catholic Faith, to obtain more grace to better serve God, drawing particularly on that gigantic source of God’s Infinite Goodness and Mercy - a source virtually untapped – PROPHETIC REVELATIONS. The Blessed Virgin said: “You love Me and make others love Me.” This revised edition of the Pieta Prayer Booklet is dedicated to Thee Dear Lady of Ephesus as an act of love to honor thine Assumption. “I am all thine my Queen and Mother and all that I have is Thine”. Scripture says: “Pray without ceasing.” St. Paul of the Cross wrote: “We enter on the broad road of perdition when we neglect prayer.” Dr. Alexis Carrel wrote: “If you make a habit of prayer, your life will be profoundly altered.” As a scientist he turned to prayer as man’s highest activity; that conversation with God to be an art of all arts. May this Pieta Prayer Booklet serve as a spiritual tool for souls who wish to increase their daily prayer life. May the Dear Angels who carried the Holy House of Loreto carry this booklet to all persons who wish to pray more after reciting the daily rosary. “The approbation of such revelations implies nothing more than, after mature examination, it is permissible to publish them for the unit of the faithful. Though they don’t merit the same credence as the truths of religion, one can, however, believe them out of human faith, conforming to the rules of prudence by which they are probable, and supported by sufficient motives that one might believe in them piously. These prayers have been copied from a book printed in Toulouse in 1740 and published by the P. Adrien parvilliers of the Company of Jesus, Apostolic Missionary of the Holy Land, with approbation, permission and recommendation to distribute them. This prayer was found in the fiftieth year of Our Lord Jesus Christ. In 1500’s it was sent by the Pope to Emperor Charles when he was going into battle. A letter written by the Blessed Virgin Mary to the City of Messina where St. Paul, the Apostle preached the gospel, which has been preserved in the Reliquary of the great altar. First - To expiate all the sins I have committed this day and during all my life. Glory be to the Father and to the Son…! Second - To purify the good I have done badly this day and during all my life. Glory be to the Father and to the Son…! Third - To supply for the good I ought to have done and that I have neglected this day and during all my life. Glory be to the Father…! Hail Mary, White Lily of the Glorious and always serene Trinity. At the hour when the soul which has thus greeted me quits the body I’ll appear to them in such splendid beauty that they’ll taste, to their great consolation, something of the joys of Paradise. The blessed Virgin Mary to St. Gertrude the Great. 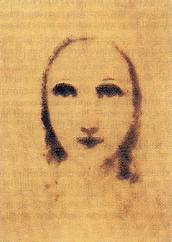 This picture of Our Lady was drawn by a mystic in Italy. Her hand was guided by Our Lady. There is a special blessing given each day to the person who carries it and another blessing given each time one looks at it with love. Lord Jesus Christ! Thou who meekly died on the trunk of the Cross for us, submitting Thy Will completely to Thy Heavenly Father in order to bring peace and to offer Thy most Holy Death to Thy Heavenly Father in order to free…(this person)…and to hide from him what he has earned with his sins; grant this O Eternal Father! Through Our Lord Jesus Thy Son, who liveth and reigneth with Thee in union with the Holy Spirit now and forever. Amen. Lord Jesus Christ! Thou Who remained silent to speak through the mouths of the Prophets; I have drawn Thee to me through Eternal Love, which love drew Thee from Heaven into the body of the Virgin, which love drew Thee from the body of the Virgin into the valley of this needful world, which Love kept Thee 33 years in this world, and as a sign of Great Love, Thous hast given Thy Holy Body as True Food and Thy Holy Blood as True drink, as a sign of great love, Thou has consented to be a prisoner and to be led from one judge to another and as a sign of great love Thou has consented to be condemned to death, and hast consented to die and to be buried and truly rise, and appeared to Thy Holy Mother and all the Holy Apostles, and as a sign of great love Thou hast ascended, under Thy own strength and power, and sitteth at the right hand of God Thy heavenly Father, and Thou has sent Thy Holy Spirit into the heart of Thy Apostles and the hearts of all who hope and believe in Thee. Through Thy sign of Eternal love, open heaven today and take this dying person… and all his sins into the realm of Thy Heavenly Father, that he may reign with Thee now and forever. Amen. As the curate heard this he said: “O Holy Father! I can’t tell these things to anyone, for they won’t believe me.” Then the Pope said: “Truly I tell thee, the Angel of God stands with me and has written the prayers in letters of gold for the consolement of all sinners. If a person had committed all the sins in the world, but that the three prayers shall have been read (over him) at his end (death), all his sins wil be forgiven him, even though his soul was supposed to suffer until the Last Judgement, it will be redeemed (freed). The person who hears them read, he won’t die an unhappy death also in whose house they will be read. Therefore take these prayers and carry them into St. Peter’s Basilica and lay them in the Chapel named the Assumption of Mary, for certain consolation. The person who will be near death, who reads them or hears them read gains 400 years indulgence for the days he was supposed to suffer in Purgatory because of his guilt. Also who reads this prayer or hears it read, the hour of his death shall be revealed to him. Amen! O my God I am heartily sorry for all my sins because of them I deserve the eternal pains of hell, but most of all because I have offended Thee my God who art all good and deserving of all my love. I firmly resolve with the help of Thy grace to confess my sins, to do penance, to avoid the occasion of sin and never to sin again. Amen. Your prayers are strongest at the Consecration in Holy Mass (raising of Host and Chalice). Each time we look at The Most Blessed Sacrament our place in Heaven is raised forever. (revealed by Our Lord to St. Gertrude the Great). Dear St. Philomena pray for us for that purity of mind and heart which lead to the perfect love of God! 1. The Mass is Calvary continued. 2. Every Mass is worth as much as the sacrifice of Our Lord’s life, sufferings and death. 3. Holy Mass is the most powerful atonement for your sins. 4. At the hour of death the Masses you have heard will be your greatest consolation. 5. Every Mass will go with you to judgment and plead for pardon. 6. At Mass you can diminish more or less temporal punishment due to your sins, according to your fervor. 7. Assisting devoutly at Holy Mass you render to the sacred humanity of Our Lord the greatest homage. 8. He supplies for many of your negligences and omissions. 9. He forgives the venial sins which you have not confessed. The power of Satan over you is diminished. 10. You afford the souls in Purgatory the greatest possible relief. 11. One Mass heard during life will be of more benefit to you than manyheard for you after your death. 12. You are preserved from dangers and misfortunes which otherwise might have befallen you. You shorten your Purgatory. 13. Every Mass wins for you a higher degree of glory in Heaven. 14. You receive the priest’s blessing which Our Lord ratifies in Heaven. 15. You kneel amidst a multitude of holy angels, who are present at the adorable Sacrifice with reverential awe. 16. You are blessed in your temporal goods and affairs. In eternity, we shall fully realize that it was certainly worthwhile to have assisted at Holy Mass daily. THE MASS WITH HOLY LOVE AND REVERENCE. St. Boneventure said: "That whoever neglected Our Lady would perish in his sins and would be damned." Each time we receive Holy Communion our venial sins are forgiven. Christ revealed to St. Gertrude the Great that each time 1 person receives Holy Communion, something good happens to every being in heaven on earth and in purgatory. The Curate of Ars said that a Communion well received is worth more than 20,000 NFF given to the poor. Each time we receive Communion our place in Heaven is raised forever, our stay in Purgatory shortened. The value of a spiritual Communion well made is enormous. We can and should make one frequently. Simply think on Jesus and how much He loves us and how much we love Him, then ask Our Blessed Mother to ask her Divine Son to come into our hearts. 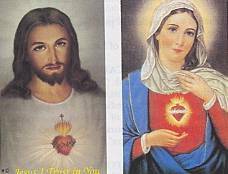 We can offer these Communions for the interest of the Sorrowful and Immaculate heart of Mary, noting our special intention! Those people, who brawl against my religion and cast slurs on this Sacred Letter, shall be forsaken by me. Women in peril at child-birth will, by keeping this Oration about them, immediately overcome the difficulty. In the houses where this Oration is kept no evil thing will ever happen; and forty days before the death of a person who has this Oration about him or her, the Blessed Virgin will appear to him or her. So said St. Gregorius. Be it known that the number of armed soldiers were 150; those who trailed me while I was bound were 23. The executioners of justice were 83; the blows received on my head were 150; those on my stomach, 108; I was beaten on the body 6666 times; beaten on the head, 110 times. I was roughly pushed, and at 12 o’clock was lifted up by the hair; pricked with thorns and pulled by the beard 23 times; received 20 wounds on the head; thorns of marine junks, 72; pricks of thorns in the head, 110; mortal thorns in the forehead, 3. I was afterwards flogged and dressed as a mocked king; wounds in the body, 1000. The soldiers who led me to the Calvary were 608; those who watched me were 3, and those who mocked me were 1008; the drops of blood which I lost were 28,430.